Through 150 pages and more than 700 large, high-quality color photos of this third volume, modelers can learn everything they need to paint the different types of camouflage. From the simplest steps for beginners to the most advanced techniques for the most experienced modelers. Volume 3 unveils in-depth explanations of how each stage of painting can be achieved for different types of camouflage, whether multicolored or desert-colored, whether it be a white wash or a vehicle in red primer , as well as all the techniques necessary to represent the effects of flaking that we see on military vehicles. The modeler will also learn how to apply effects to alter camouflage color tones with juices, filters and oil painting. Finally, we will see advanced techniques widely used today, such as Black and White, modulation, zenith, panel illumination and directional lighting. The processes highlighted in this encyclopedia are described through highly pedagogical texts and many photos allowing very detailed explanations. 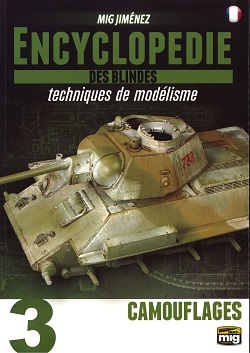 This encyclopedia is therefore the ultimate guide for the model maker, an essential tool for the workshop and all fans of models and armored vehicles. This is the third volume that completes this Encyclopedia, and each covers armored model making with exhaustive details.